New Orleans Pelicans power forward Anthony Davis (23) drives the ball against Boston Celtics power forward Brandon Bass (30) in the second half at TD Garden. 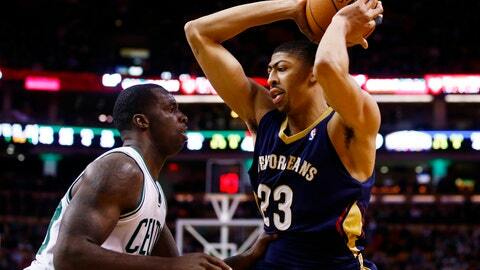 The New Orleans Pelicans defeated the Boston Celtics 95-92. Anthony Davis had 23 points and nine rebounds and Tyreke Evans scored 16 points with a key basket late to lead the New Orleans Pelicans to a 95-92 win over the Boston Celtics on Friday night. The win may prove costly for the Pelicans after reserve forward Ryan Anderson was taken from the court on a stretcher after he collided with Boston’s Gerald Wallace early in the fourth quarter. Both players went to the floor hard. Anderson had 13 points and seven boards before leaving. The Celtics said a preliminary diagnosis indicated a "cervical stinger." New Orleans won for the fourth time in six games, but had lost six of its last seven on the road. Avery Bradley led Boston with 22 points. Jeff Green and Brandon Bass each scored 16. Jared Sullinger added 13 points and 11 rebounds. Green also had 11 boards. Anderson was on his back on the court for a few minutes, getting checked out by the team’s trainer and a Celtics’ team doctor. After about five minutes, a stretcher was brought out and both teams surrounded him on the court as he was put on a back brace before being wheeled off with 11:02 to play. Wallace stood at the foul line — about 20 feet away — nearly the entire time, biting a towel. With the Pelicans clinging to a 91-90 lead, Evans scored on a driving basket, but Green hit two free throws for Boston with 35.2 seconds left. The Celtics had a chance to grab the lead after Evans lost the ball out of bounds after his driving shot was deflected by Kris Humphries. But Bradley’s drive down the middle tipped off the rim and, after a scramble, Davis grabbed the rebound. Following a time-out, Brian Roberts was fouled and hit two from the line with 7 seconds left, making it 95-92. Sullinger’s 3-point attempt caromed off the backboard and Davis grabbed the rebound just before the horn sounded. Green’s 3-pointer had given Boston an 86-83 lead with just under 5 minutes to play. After Davis’ putback sliced it to one, Jordan Crawford, who missed 12 of his initial 13 shots, nailed a long jumper, making it 88-85 with 3 minutes left. New Orleans’ backup center Greg Stiemsma, playing just his 11th game after missing 19 with a sprained MCL, scored 12, his season-high was four. Boston, which trailed by six at the half, used an 8-0 run in less than a minute to take a 65-62 lead on Bradley’s two free throws with 3 minutes left in the third. Green nailed a 3-pointer during the spree. But the Pelicans scored seven of the quarter’s final nine points to grab a 73-72 edge at the break. Both teams got off to a slow start in the opening quarter. The game was tied at 6 nearly halfway into the quarter before the Pelicans led 22-17 after one. They pushed their lead to eight late the second before heading to halftime with a 49-43 edge. NOTES: The Celtics were delayed by the snowstorm that hit the area and didn’t arrive in Boston until 1 p.m. after traveling back from Thursday’s night’s loss in Chicago. "We didn’t pick the best two cities to be traveling in and out of the past 48 hours," coach Brad Stevens said before the game. "Whether we get in at 3 in the morning or 1 in the afternoon, we have to play." … Sullinger has been bothered by a bruised left hand. "He’s uncomfortable, but he wants to play," Stevens said. "Unless he gets hit, there’s nothing really that’s a long-term issue to him playing." … Davis entered the game leading the league in blocks per game (3.2). … New Orleans’ guard Eric Gordon played his second straight after missing three with a bruised hip. He scored 12. … It was the Pelicans’ second of four straight on the road. They lost in Minnesota on New Year’s Day.